We're very proud to announce that our Allerton Project visitor & training centre has been named as a finalist in the 2014 Energy Awards. We've been shortlisted in the Energy Efficient Building Project of the Year category with the awards take place on 2nd December. The centre was opened in June 2012 and was converted from a derelict cattle shed by architect Sylvester Cheung. 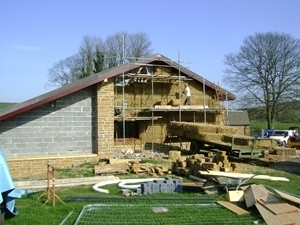 Building materials were sourced from the fields at Allerton including straw for the walls and sheep fleece for insulation. Hot water and heating are provided by the burning of wood chip in the centre's biomass boiler whilst rain water is collected for use in the toilets and showers. Electricity is provided by 16 roof-mounted solar panels. £3,352 saved on oil costs. Instead 14.5 tonnes of wood has been burnt by the woodchip boiler, cutting our CO2 by 13.8 tonnes. £225 - the cost of producing our own fuel – 90 tonnes of woodchip. Based on chipping cost at £15 per tonne. 5,930 kilowatts of electrical power have been produced by our solar panels, saving us £711 compared with purchasing from the grid. It has also brought in income through the Feed In Tariff payments, which have generated £2,490. This has reduced our CO2 emissions by 3.11 tonnes. Make sure you get all the latest news from the GWCT every week - sign up to our FREE newsletter which we send to members and subscribers every Tuesday.